So Hillary did her racist skit on Saturday and she still won't apologize. But Bill de Blasio is not running for the Democratic Party's presidential nomination. It's not just that she's tossing him under the bus, it's that she will never take accountability. What was it, six years? Six years after she voted for the Iraq War, she could finally say it was a mistake? If she wants to be a leader, she needs to lead. Wednesday, April 13, 2016. Chaos and violence continue, Haider al-Abadi's circus of failures continues, the US State Dept makes clear they (still) prefer the Talabanis to the Barzanis, and much more. HUGE #BREAKING NEWS A Number of #US Marines killed inside their Base in Northern #Iraq by #ISIS shelling. Again, no news outlet has yet reported on a shelling or the death of any US Marines. It may or may not be accurate. We'll note it and move on to the chaos that is Haider al-Abadi. March 31st, the US-installed Prime Minister of Iraq Haider al-Abadi proposed a series of 'reforms' that the US government wanted: A new Cabinet filled with people of his choosing. The did not go over well. In part because he currently has a Cabinet. In part because there are two ways to change the Cabinet. First, the Parliament can vote individual members out -- one at a time. Second, the Parliament can do a no-confidence vote in the prime minister which dissolves the Cabinet . . . but would also remove the prime minister. So there was the whole unconstitutional issue to start with. Then there was the sheer audacity of what he was proposing. Two of his proposed new members would publicly announce that they were no longer seeking the posts -- and would do so within seven days of his announcement. It was not a pretty time. Tuesday, he appeared before Parliament to announce, wait, wait, I have a new list. Forget my March 31st list that I insisted was Iraq's best and brightest! Two weeks later, I have a new list to spring on you! It was received worse than the last time around. How dramatic was the whole thing? ALSUMARIA broadcast a special program on the turmoil inside the Parliament. Click here for video of the angry reaction in Parliament. And here. Mohammad Sabah (AL MADA) calls the entire response (sardonically calls?) the continuous birth pains of democracy. It could have been more of a free for all had more MPs been present. IRAQ TIMES counts 245 plus the Speaker. They note strong words between the Speaker and members of Moqtada al-Sadr's bloc. ALL IRAQ NEWS reports MP Hairth al-Harthy led a sit-in in Parliament calling for immediate action. He is with the Al-Ahrar Bloc, Moqtada's group. The photo of the sit-in AL MADA runs shows seven male MPs and nine female MPs seated. AP notes some Sunni lawmakers also joined in the sit-in. ALL IRAQ NEWS notes 115 MPs participated at one point or another in the sit-in and that it also included some Kurdish MPs. Moqtada is the Shi'ite cleric and movement leader who gave Haider al-Abadi cover to announce his first list through a series of rallies in support of a new Cabinet. IRAQ TIMES reports that in exchange for that support, Moqtada was able to name 6 of the 14 proposed ministers. Let's hope it was worth it for Moqtada. Apparently, others were listening in to Moqtada's conversations with Haider al-Abadi. IRAQ TIMES notes that sites linked to State of Law have published the dialogue between Moqtada and Haider as a result of their phone conversations being recorded. Those paying attention may remember that State of Law led the most public Shi'ite resistance to Haider's proposal of doing away with the current Cabinet. State of Law is the creation of Nouri al-Maliki (prime minister of Iraq from 2006 through 2014). Meanwhile NINA explains that Kurdish MPs went into a private session to devise a unified front to the proposal. IRAQ TIMES notes the whole thing ended without any resolution and with Speaker of Parliament Salim al-Jubouri stating they'd vote on the new list Thursday. However, ALSUMARIA reports that 61 MPs have called on al-Jubouri to hold an emergency session today. REUTERS reports this morning that the emergency session is currently taking place. NATIONAL IRAQI NEWS AGENCY adds that Citizen Bloc MP Salim Chawki declared that this reviewing the nominees and voting will take time and that Parliament will vote on each one as an individual (and not as one vote for the entire slate). No one is commenting on what a revelation the Cabinet proposal is. It reveals Haider is uniquely unqualified to be prime minister. He proposed that cabinet in the fall of 2014. Not even two years later, he needs a new Cabinet? More to the point, forming a Cabinet is the only requirement for a candidate to move from prime minister designate to prime minister. Haider is an all out failure. His requests for a new Cabinet demonstrate this. Some Sunnis are calling for all three presidencies to be dismissed (Speaker of Parliament, Prime Minister, President of Iraq) and that would be Constitutional. It would also be the way this is supposed to be handled Constitutionally. Yet the White House continues to shore up the disaster that is Haider al-Abadi. -- Near Hit, two strikes struck two ISIL tactical units and destroyed 20 ISIL fighting positions, 16 ISIL heavy machine guns, four ISIL rocket-propelled grenade systems, an ISIL anti-air artillery piece and two ISIL staging areas and denied ISL access to terrain. -- Near Mosul, four strikes struck an ISIL tactical unit and two separate ISIL headquarters and destroyed an ISIL fighting position and an ISIL assembly area. -- Near Qayyarah, a strike destroyed three ISIL machine guns and denied ISIL access to terrain. -- Near Sinjar, two strikes destroyed an ISIL staging area and suppressed an ISIL mortar position. QUESTION: I just want to talk about Iraq. MR TONER: Great. Happy to talk about Iraq. QUESTION: So there’s a KRG delegation here in the United States. Before they get here, the KRG spokesperson said they are here at the request of the United States. I was wondering if the United States has actually invited them to be here. And they are here, obviously, from what they say, requesting for more financial help for the Peshmerga forces, especially when it comes to the liberation of Mosul. That’s my first question. The second question: I think it was last Friday when Secretary Kerry was in Baghdad, and it was notably – he didn’t go to Erbil. So the decision not to go to Erbil by Secretary Kerry – how much this decision has to do with the refusal of President Barzani to step down from presidency? MR TONER: Well, a couple things. First of all, on the KRG delegation, there is a delegation led by Deputy Prime Minister Qubad Talabani, who’s in – rather, scheduled to be in Washington. I think they arrived yesterday. They’re scheduled to be here till the 15th. They’re going to meet with Administration officials to discuss the economic crisis facing the Iraqi Kurdistan Region as well as humanitarian assistance and, of course, overall U.S. support for the fight against [the Islamic State]. As to who invited whom, I can’t speak to that, but I know they’re scheduled to meet with several Department of State officials, including Deputy Secretary Tony Blinken, Deputy Assistant Secretary for Iraq Joseph Pennington, Special Envoy and Coordinator for International Energy Affairs Amos Hochstein, and Under Secretary for Civilian Security, Democracy, and Human Rights Sarah Sewall – Sewall, rather. In answer to your second question about why the Secretary didn’t travel to Erbil, all I can say is that he was on the ground in Baghdad for a day. Obviously, there are security concerns always when he’s moving about in Iraq. I don’t think it was mean to be – send any signal to the people of the region of – Kurdistan Region, rather – Iraqi Kurdistan Region. We’ve been very supportive of their efforts to combat [the Islamic State]. They have played an absolutely vital role, in fact, within the overall Iraqi command and control structure in pushing [the Islamic State] out of key parts of the country. And – sorry – Special Presidential Envoy Brett McGurk did remain in Iraq, and he also, I believe, met with Iraqi Kurdistan Region officials as well over the last several days. So we’re fully focused on the Kurdistan Region. We’re committed to helping them as much as we can in providing what assistance we can. We're going to stop Toner right there because that's an interesting and telling slip. And I don't believe Toner's that stupid. I do believe he's a liar because he's demonstrated himself to be one repeatedly. First off, who's president in the KRG? The post travels back and forth between two families -- the Barzanis and the Talabanis. Part of the reason the CIA's been so successful creating, fueling and backing Goran ("Change'') in the KRG is because of this reality. The CIA hasn't had a great deal of success in recent years with political parties overseas. Goran's emerged as a genuine challenger in the KRG, a true third party. And that's because there is genuine resistance on the part of some -- a significant number judging by the most recent KRG elections which saw Goran emerge as the second most popular political party -- to the region being controlled by the two families. But at present, that is how the system has been rigged. So let's all stop pretending that it matters a great deal whether or not a Barzani is president of the KRG or a Talabani is president of the KRG -- or the prime minister of the KRG. Currently, Barazanis are both -- president and prime minister. And that's what's so curious about Toner's statement. He chooses to bring up a Talabani. A Talabani is part of the US delegation. 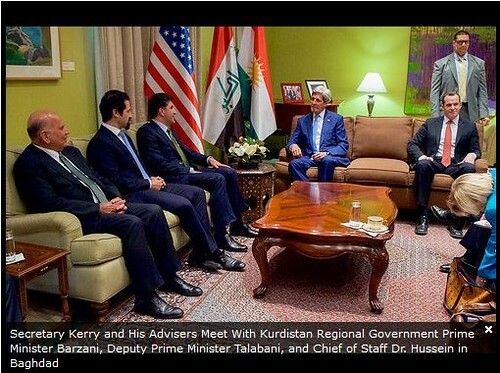 But he ignores the fact (see the photo above) that Kerry met with a Barzani while in Iraq last week -- Nechervan Barzani who is the nephew of KRG President Massoud Barzani. The Barzanis control the KDP political party. The Talabani's control the PUK political party. It's curious that Toner failed to note that meet-up or Barzani. He did feel the need to, in the same response, note Qubad Talabani. Qubad is the son of Jalal Talabani. Jalal was President of Iraq (not the KRG) starting in 2005. Officially in 2014 but the reality is that after December 2012, he was never president -- not acting president. December 2012, Iraqi President Jalal Talabani suffered a stroke. The incident took place late on December 17, 2012 following Jalal's argument with Iraq's prime minister and chief thug Nouri al-Maliki (see the December 18, 2012 snapshot). Jalal was admitted to Baghdad's Medical Center Hospital. Thursday, December 20, 2012, he was moved to Germany. He remained in Germany well into 2014. He was brought back only in time for photo ops for the national elections of 2014 -- and that was due to Goran emerging as the second most popular political party in the KRG in the provincial elections (Talabani's PUK ended up in third place). Such is the power of the Talabani family that they were able to hold onto the presidential post for nearly 18 months with Jalal out of the country and unable to speak. He should have been replaced -- per the Constitution, he should have been replaced. It's that kind of corruption that allowed the CIA-backed Goran to find eager supporters in Iraq. The State Dept has repeatedly backed the Talabani family over the Barzani family. Probably because the Barzani family has always wanted US troops in Iraq -- both during the Bully Boy Bush days and during Barack Obama's presidency. Toner's elected to choose sides again. He can -- and did -- name check Talabani. And let's note Talabani is Deputy Prime Minister. Barzani is Prime Minister. 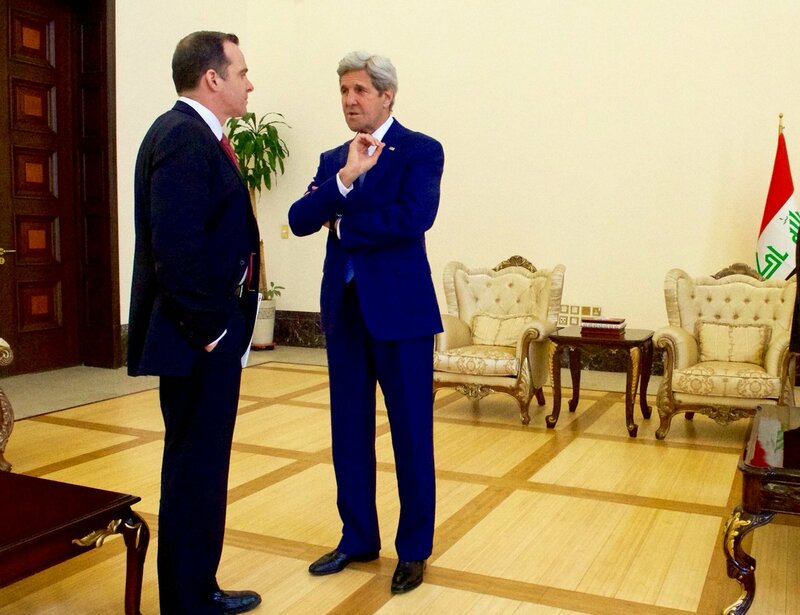 Conferring w/@JohnKerry today in #Iraq. Key meetings w/PM, Speaker, FM, KRG PM. Focus: uniting forces against #ISIL. QUESTION: So you’re saying it has nothing to do with the issue of presidency in the Kurdistan Region? QUESTION: Because last time he went to Erbil. MR TONER: I understand that. I think it was more a matter of scheduling priorities or scheduling demands. MR TONER: I mean, I don’t have anything to announce beyond the 155 million that Secretary Kerry announced when he was on the ground in Baghdad, which is obviously going towards humanitarian assistance for displaced conflict-affected areas. And that’s on top of, I think, nearly 800 million since the start of Fiscal Year 2014. But of course, we’re always looking at ways we can provide more support. Again with the racism, Hillary?